Larkspur Inspired Makeup and Honeycolor.com Lenses! 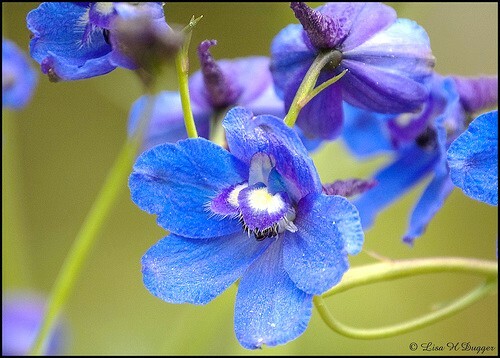 The Larkspur is a beautiful flower that has been known for centuries for its holistic, medicinal, and spiritual properties. It is also the July Birth Flower. AND wouldn't you know it? I'm a July baby!! So in celebration of July babies, I'm presenting this look for you! First I completed my foundation routine using Maybelline Dream Liquid Mousse. (I've been getting a lot of questions... that's the one foundation I use!). I always finish with a good translucent powder to set everything, then complete my brows. For the eyes I primed with Urban Decay Primer Potion and Nyx Jumbo Pencil in Milk. Then I dusted on a brow highlighter color...anything will work, pale white, pink, whatever. Orchid- Pale purple on lid. Royal- Deep blue on outer corner, crease, and lower lid. Jealous- This is a beautiful bright green that I used on the majority of my lower lid. I also used Aspen Summit #23 from Sephora as my bright color in the inner corner of my eyes. It's a bright silky white, and I can't seem to live without it lately. The lashes are TOXIC from Sugarpill. I can't even explain them! They are wispy, bold, and spottified with lime green strands!! PERFECT for this look! Blush is from the Lauren Luke Vintage Glams palette, and lips are NARS Shrinigar lipstick followed with a lovely gloss called Lola by Bare Escentuals. The lenses featured tonight are from Honeycolor.com and they are the Angelic series. I absolutely adore them! Breathtaking! The color that I am wearing are the Princess Green, and they are so incredibly pigmented, easy to apply, and comfortable...I love the delicate boldness of them. Honeycolor.com has an incredible selection of lenses, so definitely check them out if you love to play with lenses like I do :-) AND there is currently a SALE going on! My favorite! Happy birthday to all the July babies out there!! I hope you like my look for the week!! Thank you again so much for all the support and encouragement! It is SUNSHINE to me, and I grow each day. Love the colors...I need to check out My Beauty Addiction. You do such awesome work...love it! Yes girls!! Check it out!! You can get a ton of sample colors for cheap!! You can play and decide if you like them :-) And thank you!!! xoxo!! Likewise Maria!! The pleasure is mine! Thank you for your sunshine. You are too precious! my goodness...you are GORGEOUS :) Love the look! Back at ya, Niki!! :-) Thank you for stopping by! Always love it when you do!! This is a very cute look. I love the blue!! So pretty! Also, what foundation do you use? I really like the finish and how beautiful your skin looks! i just love how creative it is! very beautiful combination of colours! Lovely! Those lashes are just too fabulous by the way! Thank you so much!! YES those lashes are to die for! wow!! Your eyes! Those lenses are just perfect for this Makeup and the lashes...wow lol. You are so creative! This look is gorgeous! The blues are stunning on you! And that hair ahhhh love it !!! Ohh AND where do you get your cute bows for your hair?? I love this one!!! Forever21.com :-) Thank you ladies!! I love the colors you used and those lashes are fierce! Thank you!! AGREED!! Those lashes are fierce! I love the way that lavender color pops. You are welcome :-) Followed! Oh wow!! Gorgeous, gorgeous eye make-up!!!!! Aww Thanks, girl! You are too sweet! OMG!! wow WOW wow!! on your flawless skin and makeup. Just perfect. Loving each aspect of it. Thank you so much!! You are very sweet :) Love your blog! Hi! I am a new follower. I found you from wyosparkle's post about your birthday. Happy birthday! My son is a July baby, he celebrated his first birthday on 2nd July. Aww!! Thank you so much and Happy belated birthday to your son!! :-) Of course I will follow your blog :-) Thank you for stopping by!! Hey Lovely :) What beautiful make up, love these colours. Following your blog, maybe u can check out mines? Thank you very much! :-) Of Course! The false eyelashes are so cute. Lovely eyes makeup . Ha ha!! Thank you! :-) Awesome!